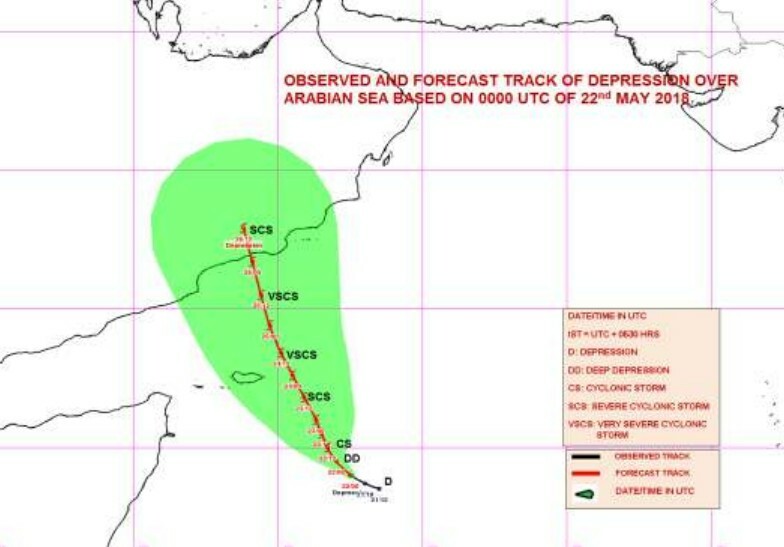 At the point made this Tuesday, May 22 at 03z, the New Delhi Regional Cyclone Meteorological Center (RSMC) located the system at 9.00N and 57.50E, about 560km southeast of Socotra Island and 970km south-southeast of Salalah (Oman). New Delhi estimates the central pressure at 1004 HPa and the average maximum sustained winds of the order of 37 to 55 km/h associated with gusts exceeding 70 km / h. Over the last 6 hours, the system is moving northwest at a speed of about 10km/h. The RSMC anticipates that the cyclonic storm stage will be reached during the day, which would be the 2nd system of this 2018 cyclonic season in the North Indian Ocean after SAGAR which had evolved recently in Gulf of Aden. Current track trends are unfavorable for the Arabian Peninsula. Members of European models guidance IFS, UKMO and American GFS, agree on a scenario landing the system on the southern coast of Oman or southeast Yemen in early weekend. The environmental conditions are favorable to allow the intensification of future MEKUNU, with a sea surface temperature of 30 to 31 ° C, low wind shear and a good divergence supported by severals outflow as well polar side as equatorial side. According RSMC of New Delhi, very severe cyclonic tropical storm stage could be reached within the next 48 hours. The evolution of the system will therefore be closely monitored over the next few days, first of all for Socotra Island and later for Oman and Yemen.